Well it all went pretty much to the script in the end. Donegal romping to a 16-point victory although the young Saffrons will look back on those missed goal chances from CJ McGourty and particularly the unlucky Matthew Fitzpatrick before half-time. Here's the match report if want to pore over the specifics again. And don't forget full deferred coverage of today's match which is starting this very minute on BBC TWO Northern Ireland. We'll be back on text commentary duty next Sunday as Ulster holders Tyrone face their old enemy Derry at Celtic Park. Hope you join us again then. Video caption: Antrim manager Gearoid Adams has 'no complaints' with defeat against Donegal.Antrim manager Gearoid Adams has 'no complaints' with defeat against Donegal. I'm very disappointed with the second-half performance. It was basically men against boys. Donegal turned on the style and put us to the sword. In the first half we gave a very good performance. We're having a lack of luck. We lost Matthew Fitzpatrick who was playing very well. We had a couple of goals chances we didn't take and points chances too. They took their scores, we didn't. We're very pleased to be in the next round but it was a poor game which never really caught fire. It was a wee bit stop-start in the second half but we were well in control. It was a very average performance from ourselves for long periods. The next day against Tyrone or Derry will give us a better indication of where we are at. 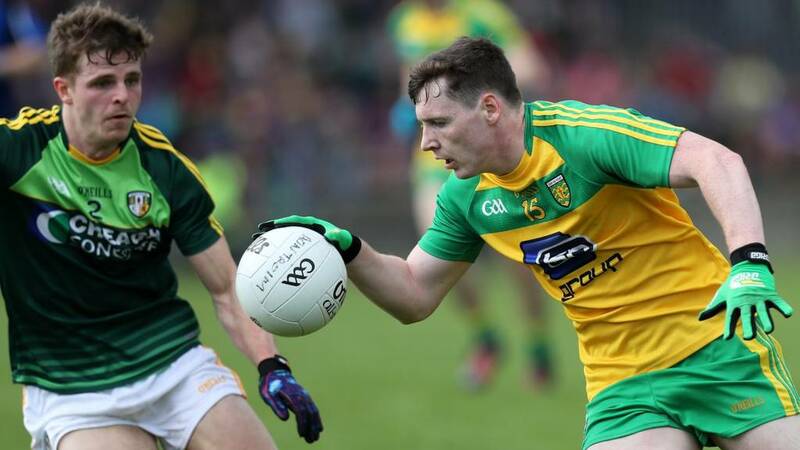 Donegal appeared unprepared for Antrim's positive tactics early on and Neil McGee admits the home side were caught out somewhat. "We didn't really know much about Antrim. They haven't been on TV much and while we know four or five of their players, we didn't have much information on the team as a whole." Quote Message: What could have been a very creditable performance for Antrim has turned into what is probably going to be a very damaging defeat. What could have been a very creditable performance for Antrim has turned into what is probably going to be a very damaging defeat. Small's goal was the last kick of the game. All over here. After Antrim's commendable first-half display, Donegal have handed out a hammering in the end. Not sure whether Donegal will learn all that much from this game though. Saffron sub Conor Small strokes in an Antrim goal deep into injury-time. McBrearty fires in Donegal's third goal in the closing moments to pile on the agony for Antrim. Another sub Michael Langan has also hit two Donegal points with McGourty and McCann hitting token late responses at the other end. McBrearty and Lacey tag on further Donegal points. Donegal showing no mercy to the Saffrons now. Five minutes of normal time left. Corner-back Paddy McGrath is able to walk the ball into the Antrim net. Donegal in complete control. Not really fair on Antrim but that hiding that Sean Kelly was talking about a minute on is now very much on with over 10 minutes left. Patrick McBrearty is now on for Donegal and he slots a free to increase the lead to 10. Quote Message: It's hard to see any route back for Antrim now. If they decide to press up, they could be in for a hiding. Hopefully, they will keep fighting in these last 15 minutes. It's hard to see any route back for Antrim now. If they decide to press up, they could be in for a hiding. Hopefully, they will keep fighting in these last 15 minutes. Murphy strokes over the point of the game from 50 metres and for good measure then knocks over a free from his hand. With 52 minutes gone, this game is surely done and dusted. Donegal starting to throw on a few subs with Karl Lacey among those introduced. But Donegal now have a double-scores lead as Murphy points a free. Surely only a goal is going to get Antrim back into the game. Doesn't look like coming though. CJ McGourty replies for Antrim from a free. But they need a few more with 48 minutes played. Michael Murphy slots another Donegal point from a 40-metre free. Looking ominous for Antrim now. Donegal defender Frank McGlynn is given far too much space as he strokes over a point from 35 metres. The home side six up. Antrim need a quick response.